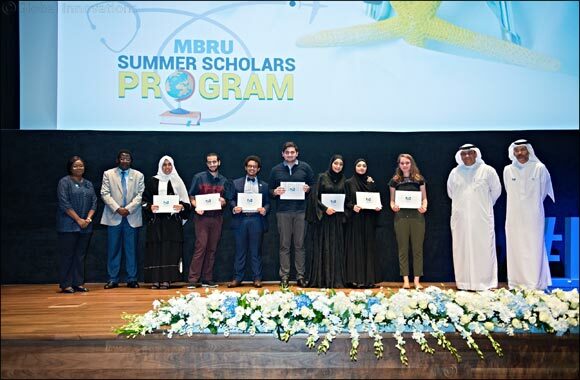 Dubai, 4 October 2018: Mohammed Bin Rashid University of Medicine and Health Sciences, MBRU, held an awards ceremony to honor 71 of its medical students who completed the unique Summer Studentship Placement Program in local and international research centers, academic institutions and healthcare facilities. Academic and healthcare institutions supporting the program were also recognized for their support towards the medical students preparing them to be tomorrow’s healthcare leaders. The ceremony was held at the MBRU campus at Dubai Healthcare City. During the ceremony, second and third year medical students showcased their work from their summer studentships in the UAE, Europe, Asia, Australia and North America. More than half of the 71 students were placed overseas, and 33 students were placed within the UAE, gaining invaluable experience and insight in leading institutions. The unique program is a collaboration between MBRU, local and international research centers, academic institutions and healthcare facilities.